A tablet can be a valuable learning tool and entertainment option for a young child. However, there are a number of things for parents to consider before selecting the right model for a toddler. Factors such as durability, parental controls and how easy it is for the child to use, are all important to evaluate when making your selection. Features, styles and operating systems differ among tablets as well. The following five options are excellent choices for toddlers. 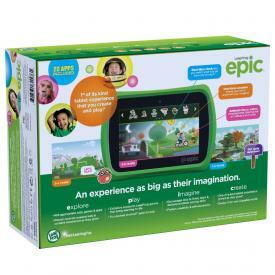 The LeapFrog Epic is a good choice for little ones for a variety of reasons. 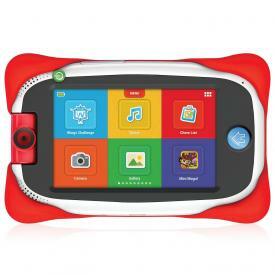 The LeapFrog brand is a well-known name in the world of children's educational electronics. 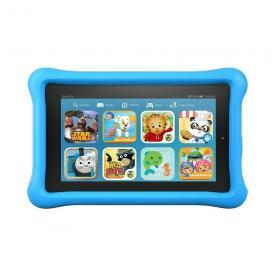 It has been rated as one of the best tablets for children by Consumer Reports, Android Central and Mac World. It includes LeapFrog's exclusive LeapSearch browser that parents can easily control as well as quick start and parental guides. It also comes preloaded with more than 20 apps, including educational games, ebooks and music. 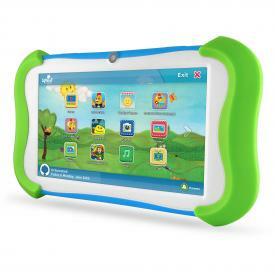 Unlike other LeapFrog devices, the Epic tablet does not require any cartridges or special equipment. The Epic tablet features a shatter-proof screen and sturdy protective bumper. A large, ten-inch screen size benefits little ones as they can easily see and navigate the screen. Although it is durable and has a number of excellent features, at 2.4 pounds the LeapFrog Epic is slightly heavier than other comparable electronics, so buyers should consider this as well. It comes with 16 GB of storage that can be increased using a micro USB card. Priced at approximately $100 on Amazon, it has plenty to offer in terms of features. The Amazon Fire Kids' Edition Tablet has been recommended by LapTop Mag and The Guardian. Tech Crunch also recommends the product and says the purchase is a 'no-brainer for parents looking to buy junior their first touchscreen computer.' A seven-inch display screen and the fact that it's lightweight (only 14.3 ounces) are excellent features of the Amazon Fire Kids' Tablet. The minimal weight is a great asset for little ones, and it comes with a durable case. Parents will appreciate that it is ready to use right out of the box. The easy-to-use parental controls allow parents to control usage and content, as well as educational goals if desired. The screen is made with sturdy Gorilla Glass, which is a good choice for younger children. The tablet comes with a worry-free guarantee that provides coverage for anything that happens to it during the initial two-year period. It comes with either 8GB or 16GB of storage, but it allows parents to expand the storage capacity up to an impressive 128GB so it can grow with the child. It comes with a one-year subscription to Amazon FreeTime Unlimited, which includes a massive library of content for children, including educational apps, books, games, movies and shows. Since the curated content in FreeTime Unlimited is geared for ages three through ten, parents will need to be selective in choosing what content to make available for their toddlers. It is priced at an approximately $100, making it an affordable choice for what it includes. Well-known for its quality electronics, Samsung has a Kids' Galaxy Tab E Lite that is a good choice for younger children. It has been named as a top tablet for kids by Digital Trends and Gizmag. Its integrated bumper case helps protect it from drops, falls and spills, and it has a specialized use mode for children that is easy to set up and use. It weighs 10.9 ounces, making it one of the lighter weight tablets for toddlers. It boasts a specialized easy-grip design that is good for little hands. The battery has a life of nine hours. The parental controls allow parents to monitor use, set time limits and control content. Although it comes preloaded with over 20 educational apps from trusted names such as Dreamworks Animation, Sesame Street and National Geographic, it has an Android-based interface and parents can also easily add appropriate apps from Google Play. 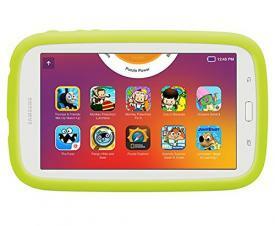 A three-month subscription for Samsung Kids is also included with purchase. This Samsung tablet comes with 8GB of storage but offers additional storage capacity up to 32GB via micro USB. Priced at approximately $130, it offers a good selection of features for the price. Highly recommended by Cool Mom Tech and Geek Dad, the Nabi Jr. is specifically designed for younger children. It features an easy-to-use, kid-safe interface and comes with over 30 apps. It has a very durable design that can withstand drops and bumps. Time controls are enhanced with fun animated characters. It boasts the Exclusive Wings First Steps Plus, which fosters early learning skills such as letters, tracing and counting. Not only is the physical design and setup good for a young child, the apps are also focused on pre-kindergarten to kindergarten level content, making it easy for parents to ensure the tablet is displaying toddler-appropriate content. At five inches, its screen size is smaller than many other children's tablets. This could, however, be a bonus in terms of portability. It is available with either 4GB or 8GB of storage and can expand up to 32 GB. Although the design is durable, at 1.7 pounds it is heavier than a number of other models. Prices range from $70-$100. The Sprout Cubby, from trusted preschool network the Sprout Channel, is specifically designed with young children in mind. Yahoo Tech rates it as one of the top five in kid-friendly tablets, and Top Ten Reviews praises the Cubby's 'strong combination of excellent build quality and software options' and rates it fourth in tablets for children. It is one of the few tablets labeled for use at age two and over. It has a hardy design and protective silicon bumper. It has 28 apps focused specifically on early learning skills in areas like math, reading and spelling. It also comes with 40 Sprout television programs. At just over 15 ounces, it is a lightweight option for little hands and comes with a good seven-inch display screen. The KidSAFE Certified Parental Controls allow parents to monitor, customize and place limits on use for their toddlers. It includes 16 GB of storage with the option of adding more with a micro USB card. Priced from $60 to $80, it is one of the more affordable options. There's no question in today's world, toddlers can learn, grow and be entertained with technology. By choosing a product that offers the right safety features and controls, is easy for a young child to use, and has a physically appropriate design, parents can let even the littlest learners enjoy a tablet.